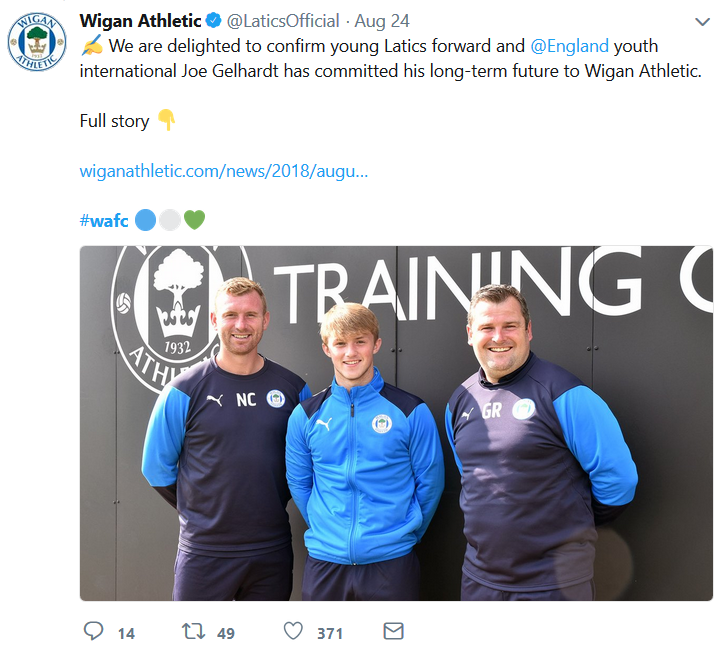 The social media and message boards have been particularly busy recently following a trio of signings the day before the first game of the season, each doing well in a wonderfully entertaining win over Sheffield Wednesday. But a lot more could happen before the transfer window closes on Thursday, with speculation abounding in the media. Moreover there has also been a rumour that the takeover will be announced on Thursday too. Once again we trawled the social media following Saturday’s game. 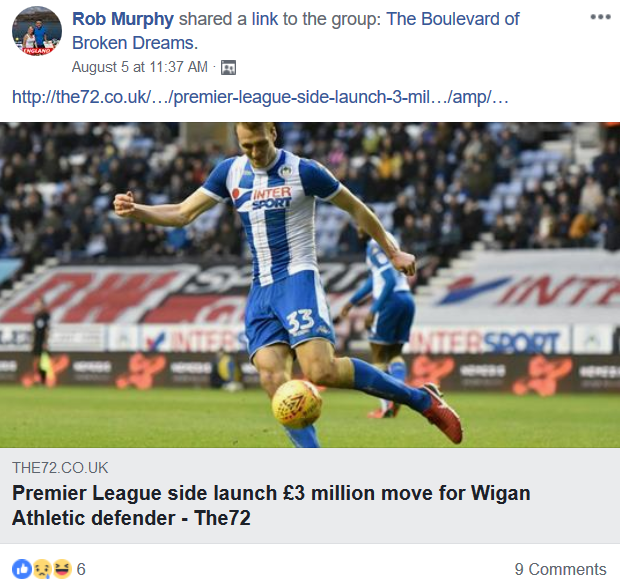 Our thanks go to the Cockney Latic Forum, the Vital Wigan – Latics Speyk Forum, The Boulevard of Broken Dreams on Facebook, and also Twitter for providing the media for the posts below to happen. Thanks go to all whose contributions are identified below. If that’s not Cheng it’s his spitting image. 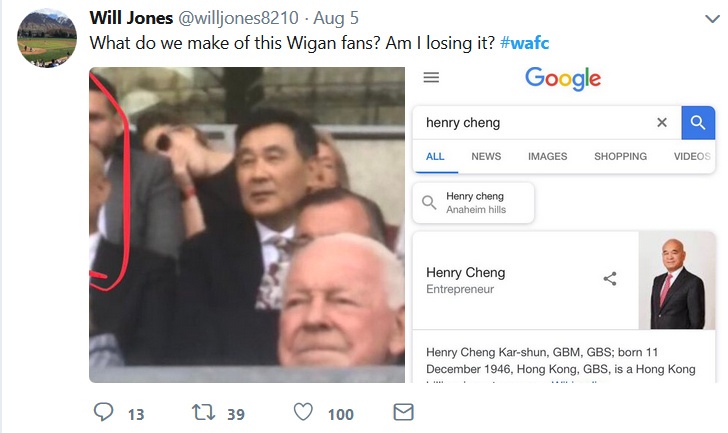 If it is him, and his family still own a minority stake in IEC, it can only be a positive to see him taking in a Latics game. Better still by all accounts he enjoyed it. Whether it’s direct involvement, or a passing interest, these things can lead to other business associations such as sponsorships and what have you. It was also good to see all of the current owners and board members sat with the prospective owners. At the very least it suggest a cordial working relationship. Same goes with seeing Royal and his son in the directors box. Better to have a smooth transition. It was Cheng (straight fm the owners suite horses mouth) he is not fronting up the transaction but is underwriting it hence some of the corporate validation delays. How much he will lump on tics is of course open to question. Been in wigan all week, and at the training ground, already paid for the new pitch (6 million), moved the worriers out of the offices and into Robin Park, initially investigating 80 million to get us in the prem, was behind Cook signing new contract. Nobody will shoot the messenger pemblue, I just hope you are right on the third part. BTW, I heard it will be announced before the deadline and there could be further additions to the squad. Gibson was MoM for me today. His 1st touch passes were excellent. Always made himself available for the ball. Robinson gave him a run for MoM. If he carries on like that he will be the best left back we have had since Baines. Not only can he cross a ball he can do it with both feet. Excellent performance – its great to see players like Jacobs and Massey proving their critics wrong and showcasing their skills to great effect. A fast-paced, enthralling attacking performance that produced countless chances against sturdy championship opposition and easily warranted more goals than the three scored. 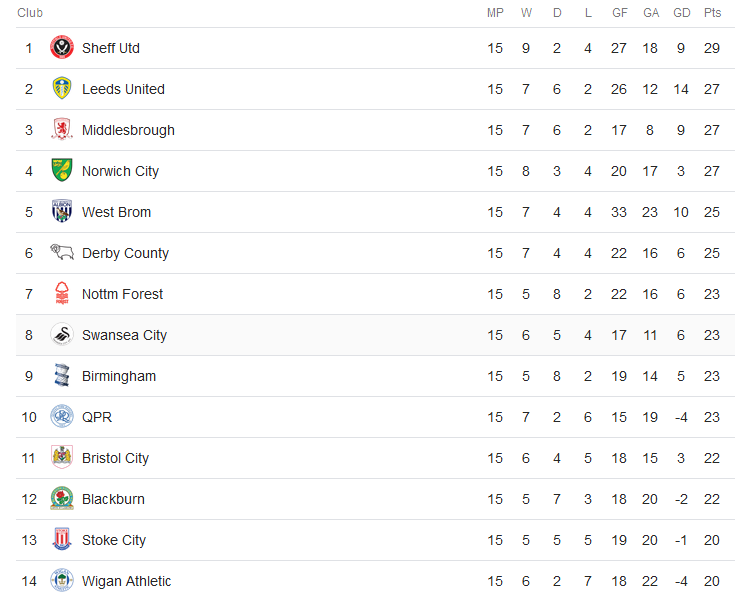 Not bad for a team filled with ‘League One players’ that allegedly lack the quality to play at the level above!! Lots of reasons to be optimistic. For his first professional game Reece James was fearless and settled well despite the odd mishit pass, Kipre was a revelation and like a rock at the back, Robinson looked quick on the break, set up the first goal and has bags of potential whilst Gibson controlled the midfield, played some great balls, broke up play and made a terrific goal saving block in the second half. 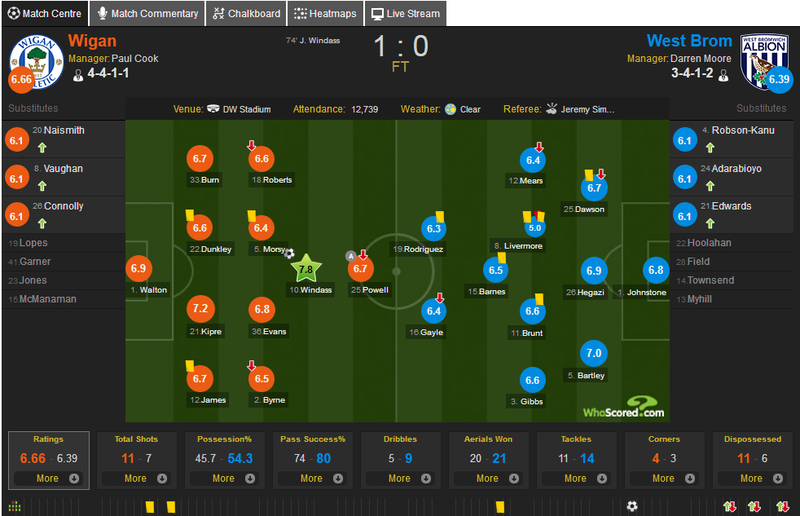 Jacobs was MOTM, scored two good goals, hit the bar with a cracking effort and got an assist for the third and you couldn’t say any of the players didn’t play well. 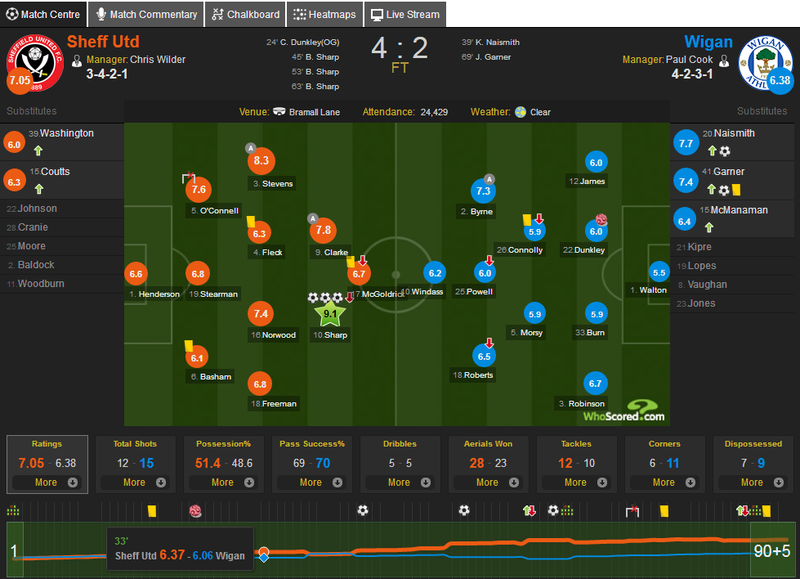 All round a great game and thought the scoreline flattered the opposition given the chances we created. If we keep that level this season should be a cracker. Kipre is only 21, a million is a snip of he develops. It’s a good example of the business plan buying young players to look at selling on for a profit. I imagine 4 or 5 will be on the way out to streamline the squad and make room on the wage bill. Even if we are flush with cash you don’t want established players never in with a chance of making the bench. Cole, Colclough, Walker, MacDonald, plus Flores & Lang, maybe on the market. Apparently we’ve left the No.10 squad number free. So that could be for an outright striker or someone to sit just behind. At this time all clubs are open to in’s and out’s. Quality players may become available we weren’t in for that we take an interest in. I was chatting with Walkers family in Glasgow. They was saying that Jamie wasn’t happy with his involvement and had asked his agent to speak with the club. He was told that he was too small and weak when he arrived which he has been working on. I can only imagine Cook has been miffed by his agents involvement and decided to freeze him out. 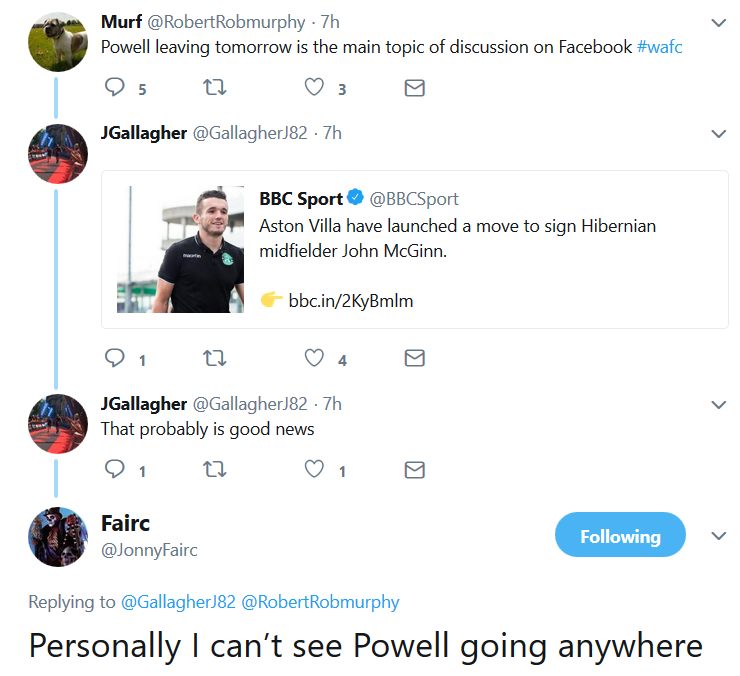 His Instagram showed him at the training ground Saturday and he has removed Wigan Athletic from his Instagram and changed his picture to him in a Hearts top. Shame as I thought he would do well this season, but I also said Gilbey would be one of our best players last season and he left on deadline day so what do I know!